PREREQUISITE: NONE! ANY KID 12-14 YEARS OLD CAN TAKE IT. THIS WORKSHOP IS FOR BEGINNERS OR THOSE WITH SOME IMPROV EXPERIENCE WHO WANT TO PRACTICE THE BASICS. one-time improv workshop for kids ages 12-14 years. ​No improv or acting experience is necessary to have fun or succeed in this workshop - it's great for beginners or kids with some improv experience who want to have fun practicing their skills and learning some new games. We will learn a bunch of classic improv warm-ups and games that you can take back to your friends & family or just enjoy with us. Improv helps us practice skills like accepting ideas from others, mindfulness, quieting judgment of self and others, communication, and more. But mostly, it's so much fun! 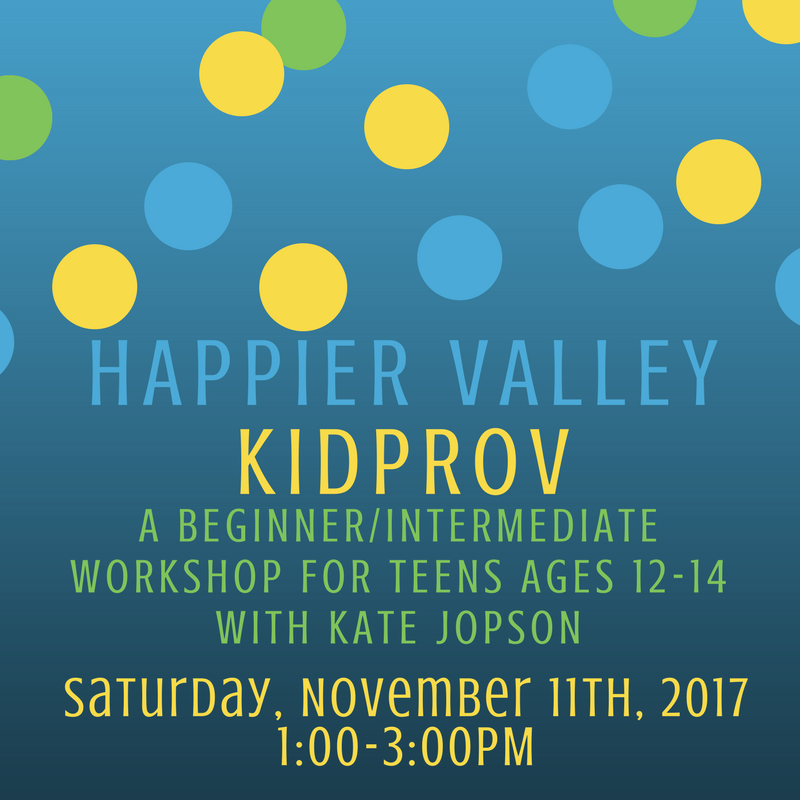 Who can take the Happier Valley KidProv Workshop? Any kids 12-14 years who has no or a little improv experience. Plus, every kid in the class receives a free ticket to the Happier FAMILY Comedy Show. Come laugh with new friends and help us make the Happy Valley HAPPIER!